Ajax, Celta Vigo, Lyon, Manchester United. We are back on Saturday for Premier League and FA Cup semi-final action. More from Jose Mourinho on his side's chase for Champions League football: "When it is not mathematically possible to qualify through the Premier League is when we put everything into the Europa League. "It is an important title and we have to keep going. Today showed how difficult it is. We are not expecting anything easy in the semi-finals". Manchester United manager Jose Mourinho, speaking to BT Sport: "We had 17 shots and 10 on target, something like that, but the game was difficult. You look through the numbers and someone might think it was total dominance but it wasn't like that. "When we put one more player in midfield we started controlling the game. It is always a risk when it is 1-1 - but from that moment it was a question of scoring and not conceding which was hard." 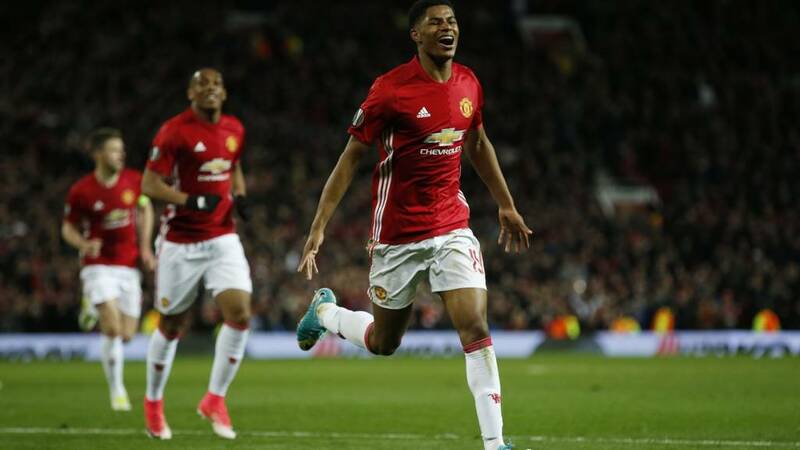 On teenager goalscorer Marcus Rashford: "You speak about his qualities and they are fantastic. But mentality he is excellent. He hadn't scored since September, some players don't understand what I want but Marcus I trust. It doesn't matter if he doesn't score - he is fantastic in his effort and attitude." On the injuries to Zlatan Ibrahimovic and Marcos Rojo: "I dont think the are easy injuries but I prefer to wait until all the tests are done and then speak. I can't do that because I am a manager not a doctor. Manchester United manager Jose Mourinho says the initial prognosis of the injuries to Zlatan Ibrahimovic and Marcos Rojo is "fairly negative". Some App users may have click the link to see this Tweet. Marcus Rashford is a superstar, no doubt. Manchester United created chance after chance after chance and eventually they put one away. It was a deserved win. Zlatan Ibrahimovic landed awkwardly, his knee jerked and hyper-extended backwards. I'll be surprised if he plays again this season and the same goes for Marcos Rojo. They both looked very nasty. Maxime Gonalons nets the winning penalty for Lyon, to edge the French side past Besiktas and into the semi-finals of the Europa League. Manchester United match-winner Marcus Rashford, speaking to BT Sport: "All you can do is keep trying to create chances, that's what we kept doing and we pinned them back. "We had a lot of chances and could have scored but sometimes games go like that. We got one in the end." On missing a couple of good chances before scoring the winner: "You just have to keep going and hope you get another chance. We've done it the hard way but none of that matters now." OK both sides have now missed their seventh spot-kicks. Some stunning penalties being taken by both Besiktas and Lyon, with both sides netting from their first six efforts. Manchester United captain Michael Carrick, speaking to BT Sport: "We did not start well because we did not capitalise on the goal. We created a few chances and didn't take them again - we thought it might be one of those nights. But we're through - that's what you have to do." On prioritising the Premier League or the Europa League as they aim for Champions League qualification: "People are saying 'what do we prioritise'? We've got to fire on all fronts. We have got a duty to do that. There is great belief in the squad, a great atmosphere and we hope to carry it on. On injuries to Zlatan Ibrahimovic and Marcos Rojo: "It is disappointing. Hopefully it is not too serious because they are two big players for us." Jose Mourinho went over to acknowledge the travelling support of Anderlecht - he was standing in front of the travelling contingent, nodding his head and applauding them. I think that is a clear sign of Mourinho hailing their unwavering support - and maybe, who knows, a slight dig at the Manchester United fans who were not as vocal. A late away goal breaks Schalke hearts as Ajax go through on away goals. Celta Vigo got the job done in normal time but a thrilling encounter between Besiktas and Lyon has gone to penalties. Job done for Manchester United, we shall wait to see what boss Jose Mourinho made of tonight's victory. They can now prepare for Sunday's Premier League trip to Burnley. Oooh big goal for Ajax. They were on their way out of the Europa League but Nick Viergever has pulled a goal back at Schalke. There goes the referee's whistle. United hold on and Marcus Rashford is the match winner. The Red Devils sneak through to the semi-finals of the Europa League. Luke Shaw did ever so well. He just got his body in the way. ...which flies inches over the crossbar. Another goal chalked off for Manchester United. Anthony Martial is the goalscorer but his effort is ruled out after being caught offside by Henrikh Mkhitaryan's pass.